[toc]Diabetes is a very common ailment that is being suffered by millions of people across the globe. Diabetes is an incurable condition in which the body cannot control the levels of blood sugar. This is because the hormone called insulin starts functioning abnormally. Generally, diabetes has two types of variations. They are Type I and Type II. In Type I diabetes, the cells of the pancreas stop making insulin while in Type II diabetes, either the cells of the pancreas stop making enough insulin or the cells of the body do not react properly to it. This is known as insulin resistance. Diabetes is known to lead to a lot of health problems such as dehydration, frequent urination, infections, ulcers, heart diseases, etc. There are many reasons responsible that lead to diabetes in an individual. In this write-up, we have provided some of the common reasons that lead to the occurrence of diabetes in an individual. Let us take a look! Lack of physical exercise is a very unhealthy lifestyle choice that can cause a lot of health ailments including diabetes. Moreover, if you do not do physical exercise, it is natural that you will put on weight and get affected by obesity and ultimately diabetes. People who are already affected with diabetes are recommended by doctors to do exercise daily as it helps them to stay healthy and fit and keep the sugar levels in the body at a normal level. Therefore, exercise is very important if you want to keep diabetes at bay. Obesity also leads to diabetes. Many fat people are at great risk of acquiring diabetes. It should be noted that this does not mean that all people who are overweight are at a risk but statistics have proved that 80 % of people who are diagnosed with diabetes are overweight. Many doctors do not favor the consumption of junk foods and fatty foods as they tend to make people obese and so they fall prey to diabetes. With children these days, eating a lot of burgers, French fries, aerated drinks, etc., diabetes is striking them at a young age. Smoking is fatal in more than a hundred ways and it is also known to cause diabetes. According to various studies, the incidence of diabetes is higher in people who smoke and the risk increases with the number of cigarettes smoked daily. Tobacco is fatal for the health and affects the normal functioning of the body. It produces a large amount of tar in the body and that makes the body vulnerable to acquiring diabetes easily. Therefore, if you smoke then it is advisable that you quit the cigarette as soon as possible. 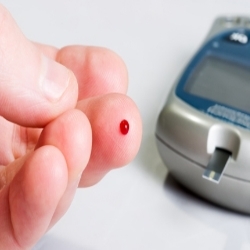 You stand a higher risk of acquiring diabetes if you have a family history of diabetes. This is one of the most common reasons due to which people acquire diabetes. If you happen to acquire the faulty genes of your family then you can get diabetes easily. The disease is mostly genetic and persists in the family genes.